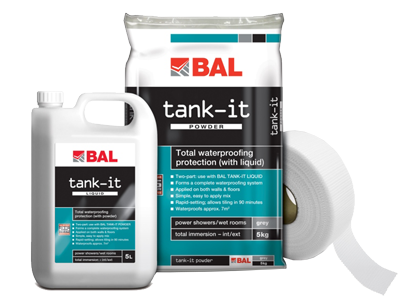 The BAL Tank-It shower waterproofing membrane is a two part power/liquid mix that when used in conjunction with adhesive backed scrim tape, provides full protection in wet environments in just 90 minutes. For a total tanking solution that includes full immersion, BAL Tank-it offers outstanding long term performance in today’s shower environments. BAL Tank-it is a rapid-setting, rapid-drying, two-part, highly polymer-modified, waterproof cementitious based system for walls and floors. BAL Tank-it can be applied simply using a standard notched trowel, brush or roller. The waterproofing membrane is easily applied and once set will support tiles up to the weight tolerance of the background/substrate being tiled. Coverage 0.73m²/kg (per 1mm thickness) but may vary dependent on nature and flatness of surface, and on trowel used. Drying Time Tile after: 90 minutes (at 20°C). Shelf Life 12 months under normal dry conditions. Protect from frost and damp. Application/Usage Do NOT use in temperatures below 5°C or in damp conditions. Packaging 5KG Powder, 5Ltr Liquid and 20m Tape.